I have always loved revolving doors. Many of the downtown stores where I grew up had them. The early ones were mechanical. requiring people to push the door as they walked to make it turn. When I was young, friends and I would each get into a wedge and push it as hard and fast as we could round and round. We would only stop if someone else actually needed to use the door or one of the store employees yelled at us. Later, as stores started to put in those slow revolving electronic ones, the game became one of waiting till the last second and jumping into the wedge before it disappeared past the door jamb. As an adult though, I find myself looking at revolving doors in a different light. In a world where everything seems to be moving too fast a revolving door makes you stop and wait, if even for a second or two. 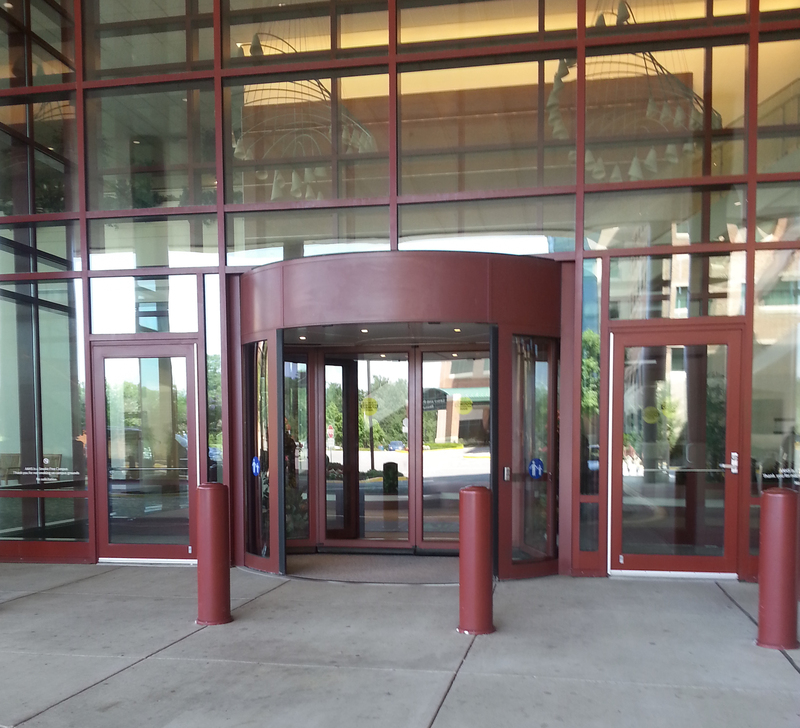 Of all the revolving doors I have met though, this one is my favorite. If you look close at the bottom of the door you can make out a circular area on the concrete joining the two outer wings. For this door you stand within the circle and the central glass portion sweeps around you allowing you to walk into the building. No wedges, no pushing, no trying to time when to walk between two moving walls of glass. No matter how I find myself hurrying from the parking lot to get inside, once I enter and allow this door to sweep around me, I find myself slowing down and relaxing. I allow myself to wait for the door to let me in, or out. It moves at it’s set speed and being patient I reach my destination. When photographing in natural light one also needs to be patient. Early dawn may be too dark for that landscape you got out of bed for and drove thirty miles in the darkness to photograph. But however impatient you may be daylight will come at it’s own pace. And only at it’s own pace. Waiting for the light involves more than just the amount of light. Light cloud cover often gives a softness to the light. In that light flowers often look better than flowers photographed in harsher, bright sunlight. For some images the longer shadows seen later in the day work well. Shadows you won’t get at any other time. The same patience is needed for weather. Light rain might add a sense of moodiness to an image. Were you planning on it raining? Can you make the rain work in your favor? Can you plan that shoot for another day? Clouds obscuring that full moon? Sorry, ranting and raving won’t make them part. I know, I tried it. Twice. Again patience. Slow down, breathe and take the best course of action. I know that most of us have busy lives. If I didn’t this post would have been written when I thought of it last week. Waiting for the light is not as simple as stopping to breath when waiting for a revolving door to turn. But just as that door closes behind the one world and opens upon another the differences in light can be dramatic. Like the difference between night and day. This entry was posted in inspiration, natural light and tagged clouds, create, full moon, games with a revolving door, inspiration, lighting, patience, playing with a revolving door, revolving doors, waiting for the light, weather. Bookmark the permalink.